Happy Meal and I had a hankering for cheeseburgers, and we had an about-to-expire Groupon for Burgerim. Game on! 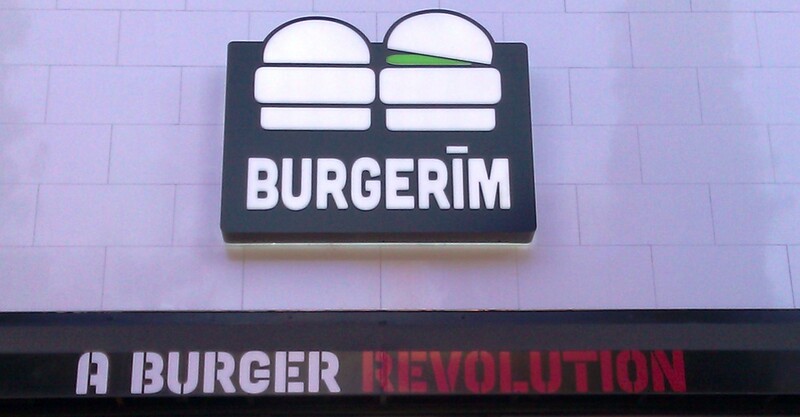 Burgerim is Hebrew for "multiple burgers." There were more than 70 locations of Burgerim in Israel. This was the only US location of the popular franchise. Burgerim had opened up shop atop the ashes of the ill-fated, underwhelming, and mercifully defunct O'Burger. O'Burger had distinguished itself a few years ago by serving up one of the worst burgers in Los Angeles. It was only up from there. Here's an excerpt from the website of the US outpost of Burgerim: "...Our savory mini-burgers are infused with Mediterranean flare and served with a variety of gourmet toppings, so you can customize to your taste bud’s delight! Want natural? We’ve got natural. Our all natural, hormone-free meat and veggie patties are snuggled between light and fluffy, egg washed French buns. We use 100% all natural preservative free fresh buns that are delivered daily, hot out of the oven..."
While Happy Meal and I were dubious at the prospect of a mini-burger being anything better than mediocre, we were willing to try. We ordered an assortment of burgers: Signature, Mergez, and Kobe. The menu offered 9 kinds of burgers including chicken, tuna, beef, lamb, and veggie. I would be about 4 bucks/burger, if you were paying full boat. We settled in for a brief wait. Our burgers were delivered to our table in about 10 minutes. 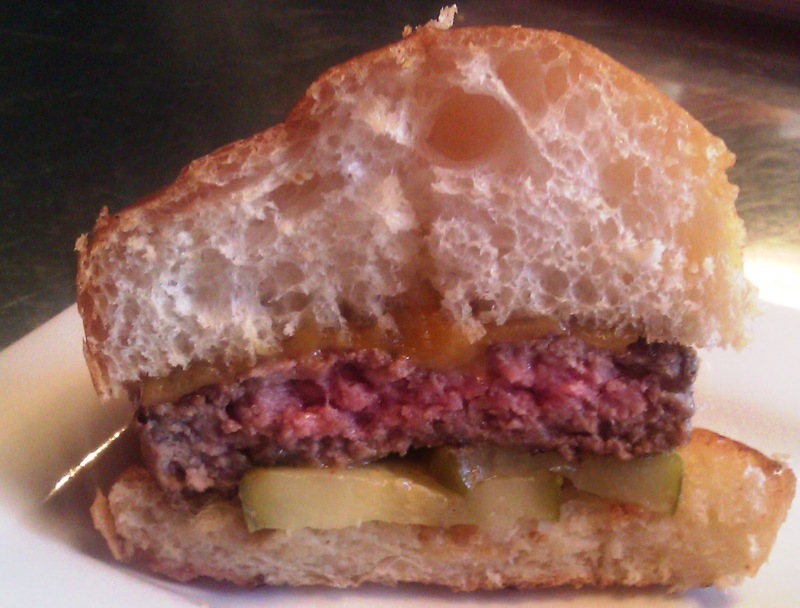 The Beef: The 3.25-ounce burgers were sourced from a mystery purveyor, but they were hormone-free. The Kobe beef was grass-fed. I presumed that cut of beef was Chuck. The Signature Burger and the Kobe Burger were virtually identical in terms of flavor and other characteristics, while the Mergez Burger was like a dryish Mediterranean (beef and lamb) meatloaf. The Kobe beef was a little denser than the Signature beef, but that was about it. 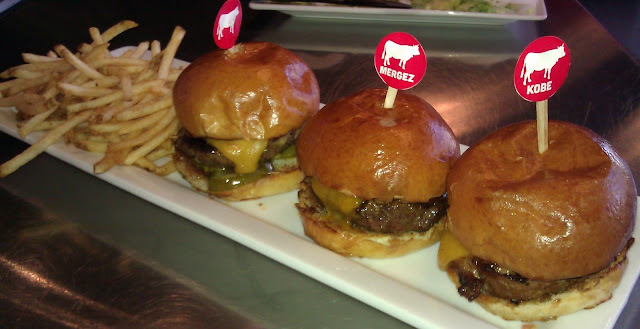 I would pass on the Mergez and stick with the traditional choices, because the traditional burgers were exceptional. The beef in the proportionally thick mini-burger patties was surprisingly juicy. There was a strong punch of beef followed up with a hint of minerality. There was no funk, but this was fine in the case of Burgerim. The fat content in the medium/coarsely grind beef was 20%. The beef was a real standout, and really quite surprising. The Seasoning: The kitchen nailed this with a dusting of something savory. The seasoning was just right. The Sear: Burgerim did what they could. 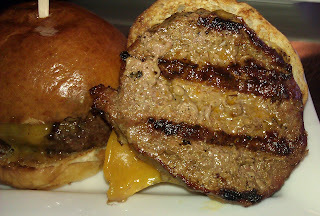 The super hot, gas-fired grill got competent, dark, and deep char marks on the burger patties. The mild char flavor was a welcome addition to the bite. The Preparation: The burgers were tender enough on the palate to suggest that the patties were formed by hand on the premises. Presumably, this was done during the prep cycle, since it would have been cumbersome to form up tons of small patties during the rush. The burgers were cooked to a juicy Med-Rare. The Cheese: Our choices were Pepper Jack and Cheddar. We went with the Cheddar. It was a solid choice! The Cheddar was bold, sharp, and savory. Furthermore, the Cheddar added a strong iron note to the burger along with some gooeyness. The cheese was a winner. The Bun: While the website suggested a French bun of some sort, the counter staff informed us that the bun at this Burgerim was a locally sourced Challah bun. Regardless, the bun was fluffy, moist, fresh, and it managed to stay out of the way of the delicious meat and cheese. The unseeded bun was lightly toasted. The Meat To Bun Ratio: This was perfect. It was surprisingly spot on considering the fact that the burger patties were not a standard size. The Toppings: I tried the Harisa. I hear this is what passes for hot sauce in other parts of the world. This was so mild that I would suggest rubbing it on minor scrapes and burns. The shredded lettuce was fresh, and the tomato slices were rich, ripe, and juicy. The Fries: The fries, while not cut in house, were just fine. These were peel-on, par-cooked, and properly crisped shoestring fries. The seasoning on the fries led me to believe that they were cooked in rice bran oil, but I was informed that Burgerim used plain old vegetable oil. I had to fight Happy Meal to get my share of the fries. The Value: With the Groupon, Happy Meal and I got fries, a drink, and 5 mini burgers for $11. This would have ordinarily cost us 2 bucks. With the discount, the value was stellar. Without the discount, the value was just fine. $22 for really good cheeseburgers and fries made sense. Burgerim eclipsed the former tenant of the West Hollywood space by providing exceptionally good cheeseburgers at a really fair price. I bought another Groupon for Burgerim today at Happy Meal's strong insistence. We generally don't return to a place that we have sampled, but Burgerim was just that good. Burger Review : Burgerim served one of the best burgers in Los Angeles. Go there, and go there soon. "...the Kobe Burger were virtually identical in terms of flavor and other characteristics..."
That is b/c it's NOT Kobe. Unless you live in Japan, or have lucked out and had someone smuggle it into America, you are not eating Kobe Beef. In reality, barely anyone on earth has actually ever consumed genuine Kobe Beef. 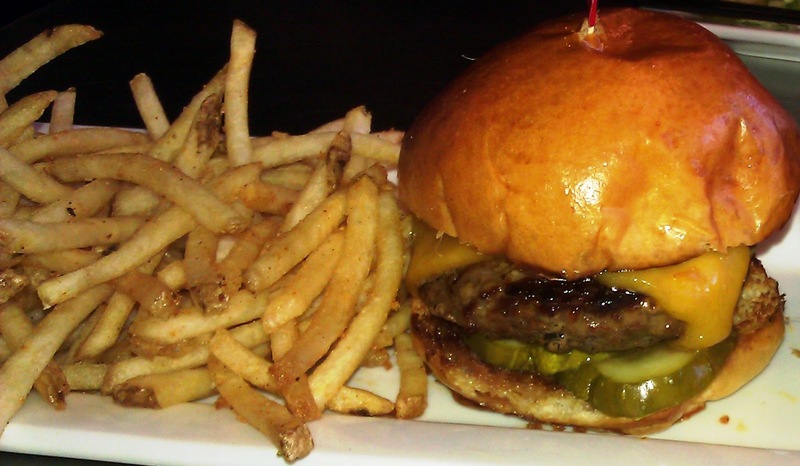 Yep--the burger, which was named "Kobe Burger" was likely sourced from Wagyu beef. If this place was so great why did it close after just several months? Did its real owner Eric Michael Pony (google the crook's name) get sent back to prison again?! It's sad that such a good burger joint had such a short run. Too many great burger joints have been shuttered in their prime. Why did they close? I have no idea....I just know that Happy Meal and I will miss a darn good burger. I live in Memphis, TN my first time trying Burgerim was today on Highland st. I ENJOYED EVERYTHING I ORDERED!! I will probably be a regular at this place!! !